I Teach. We All Draw. This was done a few weeks ago. 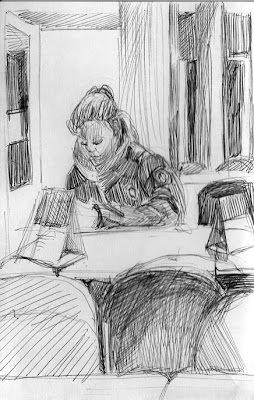 The model we had scheduled for my life drawing class did not arrive so we went out into the lunchroom to draw whoever was hanging out between classes. This young lady was busy texting. The text mavens are all very good to draw. They are so intent on what they are doing they remain very still. It’s almost a trance state. I don’t really know how healthy all this digital activity is for them, but it’s good for me as an artist. Janet models for us often. Both she and we look forward to our sessions together. She is entertained by our banter and we are delighted by her beauty as a person as well as her beauty physically. It truly is an artistic collaboration. She knows Eleanor, our studio host, so well that she asked whether she should stick out her tongue for one of Eleanor’s surreal drawings. Eleanor is doing a series on Lilith as the ancient Sumerian deity and as the bad girl of Jewish tradition. Lilith is purported to have been Adam’s first wife but she refused to submit to Adam’s will sexually. Her punishment for such impudence was to become a demon. She gets a double demotion from deity, to human, to demon. I think her position as demon is preferable to the position that would have been imposed upon her as Adam’s chattel. Considering that Janet was a little bummed-out over a relationship issue, the myth of Lilith seemed apropo. She looks as sad here as she felt. She was angry over the situation as well. She is one feisty woman and we approve heartily.